Developing an effective practice routine can be a very difficult task. Now of course, what you practice is normally based on your level of ability. We can also structure a program of basic skills exercises that you can practice daily to maintain and strengthen your core musicianship. 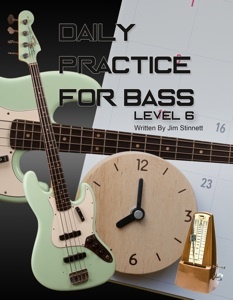 This is the purpose of Daily Practice For Bass. All top professionals in any endeavor have their routine for success. I am confident you can find a starting point for self improvement located in these daily exercises.